David Ohnstad receives his award from President Larry Goodwin. Congratulations to David Ohnstad on being selected for the 2016 Student Leadership Award. He was chosen for the honor based on the votes of his peers, members of the graduating class of 2016. He was selected from a group of four finalists during a vote held at the 2016 Senior Salute. The additional Student Leadership Award finalists included Bianca Aspin, Michael Jackson and Ari Skalisky. 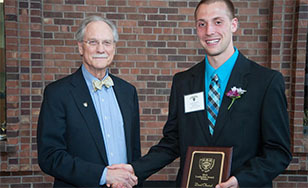 President Goodwin announced David as the recipient of the award, and recognized each of the four finalists during the Student Leadership Award Ceremony on May 4 in the Benedictine Commons. David has logged more than 1,200 hours of volunteer service to the College, including service at Community Day, assistance in the Chemistry Lab, and three academic years as a Delta Leader. He has served as president of the Biology, Biochemistry/Chemistry and PA Clubs. David has also served as a Resident Advisor, and during his senior year was president of the basketball team. David's off-campus volunteerism has included membership in the Knights of Columbus, where he has assisted in fundraising efforts related to cancer research, local community relief, and other activities in under-served communities. Following graduation on May 14, David plans to pursue his education to become a Physician Assistant. Congratulations, David, on your exemplary achievements!